When I walk into the sun-lit, green-tiled kitchen, the granite-covered island is already carpeted by numerous jars and bowls filled with aromatic ingredients for a six course Thai lunch: dusky coral dried shrimp, nubbly kaffir limes, pungent pickled garlic and pointy scarlet peppers. The six women in this informal cooking club are busy chopping, stirring, chatting and laughing while sipping glasses of Thai iced tea. They are all mothers of students at Ecole Bilingue, Berkeley’s French American school, and periodically meet to tackle the cuisines of different cultures. Today’s cooking guide is Siriporn Thakhunthod, whom everyone calls “Pon”. Growing up in Thailand, Pon cooked for her 3 younger siblings while her parents were out chopping wood and began working at a restaurant at the age of 14. 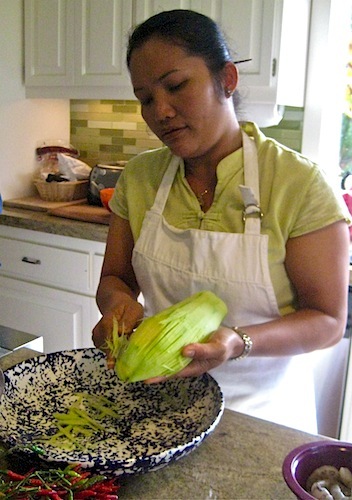 She moved to California less than 3 years ago and has been teaching Thai cooking ever since. I snagged an invitation to this delightful Thai cooking lesson by accident, while researching my last post on a Japanese tea room in an Oakland jewelry shop. When Cottie, one of the tea students, learned of my interest in food and culture, she warmly extended an invitation and I gratefully accepted. Coincidentally, my own daughter, who is now in college, was also a student at EB, as the French school is commonly called. The logistics of preparing a 6 course Thai meal might fluster even the most experienced cook, but Pon’s calm and cheerful manner makes it all seem like child’s play. She doles out tasks and demonstrates techniques, such as slicing the firm green papaya into shreds by holding the fruit in her left hand and maneuvering the large, dangerous-looking knife with her right. As mothers of elementary and middle school children, these women’s instinctive response is a chorus of, “Careful, don’t cut yourself.” Pon smiles demurely and keeps hacking away at her papaya, politely refusing to chop it on a cutting board, since this is the way she always does it. She, in turn, challenges the mothers to try her technique. The women are game and despite the awkwardness of clutching a papaya precariously in one hand while whacking at it with a large knife held in the other, no one cuts a finger. For the sticky rice, Pon demonstrates another technique and a unique piece of equipment: a woven straw cone holds the rice as it steams so that each grain cooks separately. The tricky part is slinging the mound of rice up and flipping it over inside the cone without breaking any rice. EB’s website proudly announces that its students represent 43 nationalities, and fittingly, the six women at this cooking class each have a different cultural background. Cottie is Chinese, Leilani is from Hawaii with a Filipino heritage, Anshu (who generously offered her house for the cooking lesson and lunch) is Indian, Jacqueline is Vietnamese, Marie-Jose is French, and Tamara is Polish American. Their various cultural experiences contribute to some spirited debates about a number of topics including wildly divergent views on the amount of chili needed to achieve the desired amount of spiciness. But since Pon is in charge of making an authentic Thai meal, she has the final say. With great anticipation, we all take our places at the dining room table. The first course is Tom Yum Goong, the classic Thai fragrant soup with shrimp, straw mushrooms and just a hint of heat (recipe follows). Everyone agrees it is the best version they have ever tasted. 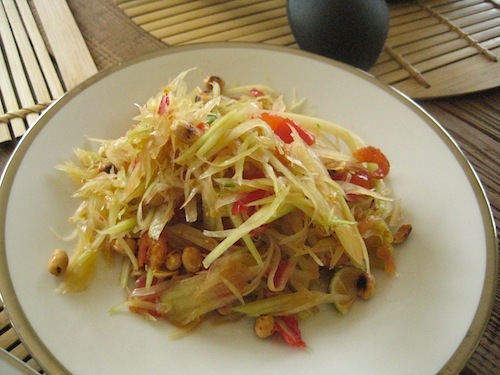 For the next dish, Green Papaya salad, Pon shows how to eat it in the traditional Thai way. She takes a small hunk of sticky rice in her right hand, rolls it into a ball and uses it to scoop up a portion of salad and pop it in her mouth. Even though the salad looks innocently refreshing, Pon has definitely dialed up the heat and after a few bites Marie-Jose dashes for some more Thai iced tea while Cottie fans her mouth, gobbles some plain rice and removes her steamed-up glasses. Although everyone agrees that Pon’s dishes are tantalizing and beautifully prepared, as the meal progresses, it becomes apparent that the group is divided into two camps: those who relish the fiery chili flavor and those for whom it is more of a dining challenge. This split is probably rooted in childhood, since it seems to be a bigger obstacle for people who grew up eating non-spicy cuisines (such as French and Chinese. As someone who grew up on Jewish influenced Californian cooking, I definitely count myself in this group, as well). Jacqueline says that Vietnamese cuisine does include chili peppers but serves them on the side so each person can add their desired amount. Tamara, who has traveled extensively and lived abroad has learned to like spicy food and Anshu, who grew up in India, even adds some extra chili sauce to her servings. When the dessert comes — sticky rice cooked in sweetened coconut milk, served with slices of sweet mango — the cooling effects are welcomed by all. 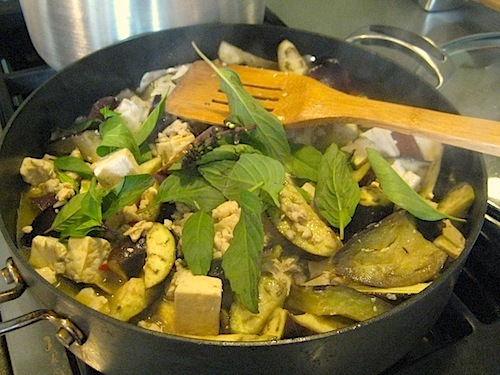 *Pon recommends Sun Hop Fat 1 at 501 East 12th Street in Oakland for purchasing these more exotic Thai ingredients. 1. 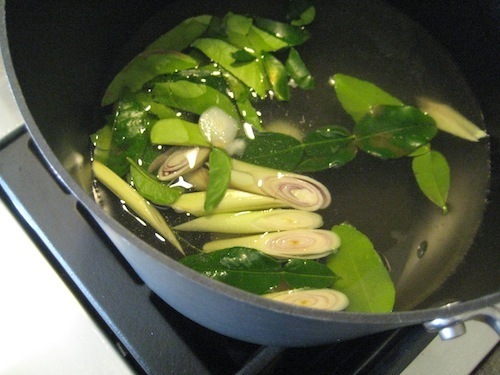 In large stockpot, put in broth, galangal slices, kaffir lime leaves, lemongrass and bring to a boil. 2. Add mushrooms, and let cook 3 minutes. 3. Add lime juice, fish sauce, chili paste, garlic, garlic juice and chili. Cook about 10 minutes. 4. Taste to see if it needs more fish sauce or lime juice. 5. Before serving, add shrimps, cook a few minutes on medium heat until they turn pink. 6. Serve garnished with sliced green onions and cilantro. 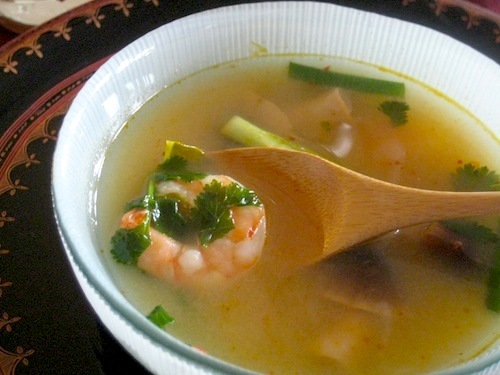 Note: Thai diners know that certain ingredients in the soup (the galangal, kaffir leaves and lemon grass) are there for flavor, but are not to be eaten. If your guests are not familiar with Thai food, you may want to fish out these items before serving or tell them which bits not to eat. This entry was posted in gluten-free food, Thai food and tagged Ecole Bilingue, Thai cooking, Thai cooking class, Thai cuisine, Thai food, Thai green papaya salad, Tom Yum Goong. Bookmark the permalink. Hi Anna, great article! I learned how to make each of these dishes in Thailand where I stay with a Thai family. I, too, was freaked at the sight of the big knife on the slippery green papaya…and found a hand held shredder that works just as well and is a lot safer at Bed Bath and Beyond. I love my green papaya salad aka Som tom extra spicy!! Every time I go I bring home curry paste from Thailand and it stores well in the freezer. I also have a kaffir lime tree on my deck as that is one of my favorite “must have” Thai flavors. I am currently experimenting with rooting lemon grass and hope to have it in a pot soon. I hear that if you put it in the ground, it grows like bamboo and can take over a yard. Wow, Sue. I knew that you were a frequent traveler to Thailand but I didn’t know about your cooking and gardening talents. What a great idea to grow your own “exotic ingredients” instead of having to hunt them down in a store. I will keep you in mind as a good resource if I meet others who want to do the same.